eInterventional Neuroradiology Department (H.S.C. ), Koru Hospital and Bayındır Hospital, Ankara, Turkey. BACKGROUND AND PURPOSE: Flow diverters have been increasingly used lately in off-label, distal intracranial aneurysm treatments. Our aim was to evaluate the effectiveness of flow diverters in the treatment of middle cerebral artery bifurcation aneurysms and to analyze midterm angiographic patterns of regional flow modifications for safety and clinical outcomes. MATERIALS AND METHODS: Consecutive patients treated from January 2010 to December 2014 by the authors by using endovascular flow-diverting stents for MCA bifurcation aneurysms were evaluated retrospectively with prospectively maintained data. All patients had been followed for at least 12 months after treatment, with at least 2 control angiograms; regional flow-related angiographic modifications were registered by using a new angiographic outcome scale for flow diverters. Data were analyzed with emphasis on procedure-related events, angiographic results, and clinical outcome. RESULTS: Fifty-eight patients were included in the study, with 63 MCA bifurcation aneurysms; 13 of these were large and giant. Pretreatment mRS was 0 for 12 patients (20.7%), 1 for 41 (70.7%), and 2 for 5 patients (8.6%). Six-month control revealed mRS 0–2 for 57 (98.3%) patients and 3 for 1 (1.7%) patient. Procedure-related morbidity and mortality were 8.6% (5/58) and 0%, respectively. From 95% of still circulating immediate postprocedure angiographic outcomes, 68% progressed to aneurysm occlusion at 6 months and 95%, to occlusion at 12 months, with a 0% aneurysm rupture rate. CONCLUSIONS: Flow diverters seem to be an effective treatment alternative for complex MCA bifurcation aneurysms, with reasonable complication rates. Longer angiographic follow-ups are needed to assess the morphologic outcome; immediate subtotal occlusions do not seem to be related to rupture. Flow-diverter (FD) stents have provided a paradigm shift in endovascular cerebral aneurysm treatment. Initially approved for carotid aneurysms, their use has been extended to include distal intracranial localizations such as MCA aneurysms.1 Covering intracranial arteries with FDs has recently been the subject of debate. While for localizations such as the posterior communicating artery,2 side branch coverage does not seem to have clinical consequences for patients, controversy exists regarding MCA branches. The objectives of our study were to evaluate the clinical and midterm angiographic outcomes of FD stent placement for MCA bifurcation aneurysms with emphasis on the regional flow-induced modifications and their impact; the analysis was performed by using an angiographic classification3 that takes into account the hemodynamic evolution of the aneurysm and the regional anatomy with time. Therapeutic decisions were made by multidisciplinary consensus between interventional neuroradiologists and neurosurgeons. They were based on patient history, clinical presentation, and DSA; cases considered unfavorable for conventional endovascular treatment and failures or retreatment after previous endovascular or surgical procedures were selected. The patients' preferences were also taken into account, after having been informed of the risks of all potential alternatives. Written consent was always obtained before the intervention. Antiaggregation protocols have been previously described.4,6 No patient was treated with <40% platelet inhibition. Since January 2013, the protocol was modified by 2 operators (H.S.C., I.S. ): Prasugrel replaced the dual antiplatelet regimen of clopidogrel and aspirin. All patients remained on dual antiaggregation or prasugrel for at least 6 months, continuing with aspirin monotherapy thereafter. Therapeutic procedure details have been previously reported.5,7 For uncomplicated cases, single FD coverage and slight oversizing of 0.25 or 0.5 mm in diameter were favored, except for large and giant aneurysms. Systematic oversizing was done to decrease mesh density across the aneurysm neck, to obtain a slower progressive aneurysm occlusion with less risk of abrupt occlusion of the vessel coming off the sac. The presence of clips or stents was not a contraindication for the use of FDs in this study, but the treatment strategy and technical details remained at the discretion of the treating physicians. Patients were clinically assessed with the modified Rankin Scale at each time point. Clinical statuses after treatment and eventual neurologic deficits at discharge or at follow-up were recorded. Any delayed clinical event, transient or permanent, was noted. Immediate postdeployment DSA included DynaCT (Siemens, Erlangen, Germany) or VasoCT (Philips Healthcare, Best, the Netherlands) with diluted iodinated contrast medium, to assess stent apposition to the arterial wall, in addition to standard and working projections. At least 2 DSAs were performed at 6 and at least 12 months postintervention, including 2D and 3D selective angiographic runs. Results were evaluated according to the Cekirge-Saatci grading scale.3 Symptomatic narrowing or occlusion indicated occurrence of any transient or permanent symptoms attributed to compromise of the relevant branch; “reopening” indicated that a branch was enhanced better on a later DSA than in a previous study. The Fisher exact test was used for quantitative data after verifying normality by the De Agostino-Pearson test; the χ2 test was used for qualitative data. Statistical analyses were performed with appropriate software (Statistica; StatSoft, Tulsa, Oklahoma); the level of statistical significance was P ≤ .05. In the 5-year period, 58 consecutive patients (17 men, 41 women; mean age, 52.4 ± 11.1 years; range, 25–74 years) with 63 MCA bifurcation aneurysms were included in this study. Pretreatment mRS was 0 for 12 patients (20.7%), 1 for 41 (70.7%), and 2 for 5 patients (8.6%). There were 10 large (15.9%) and 3 (4.8%) giant aneurysms, with the remainder being small. Thirty-eight of 63 aneurysms (60.3%) were in the right MCA, and 39.7%, in the left MCA. One aneurysm was treated on day 11 and another on day 1 post-aneurysm rupture (the latter aneurysm had been clipped 1 year before); 9 aneurysms were previously ruptured but were treated after the acute phase. Fifty-two aneurysms had FDs as the first treatment, and 11, as the retreatment; among the latter group, 1 was a clipping failure and 10 were recurrences (1 previously clipped and 9 previously coiled aneurysms). Before FD treatment, 5/11 were classified as having a neck remnant (45.5%), and 6/11, as having an aneurysm remnant (54.5%), according to the Raymond-Roy classification. The first-treatment aneurysms had a mean aspect ratio of 1.6 ± 0.7 (65%, ≤1.6, and 34.6%, ≤1.2) and a mean dome-to-neck ratio of 1.4 ± 0.5 (73%, ≤1.5). Fifty-seven aneurysms (90.5%) were treated with the Pipeline Embolization Device (PED; Covidien, Irvine, California), 5 (7.9%) were treated with the Flow-Redirection Endoluminal Device (FRED; MicroVention, Tustin, California), and 1 (1.6%), with the Silk flow diverter (Balt Extrusion, Montmorency, France). Most of the aneurysms were treated with single FD coverage (58/63, 92.1%), 2 were covered in a telescopic fashion (3.2%), and there was adjunctive use of coils due to the large size for 3 aneurysms (4.8%). In 3 other cases of single-FD coverage, the FD was deployed in a previously existing conventional intracranial stent. Of the 63 aneurysms, 23 (36.5%) were treated with prasugrel, and 40 (63.5%), with double antiaggregation with clopidogrel and aspirin. Among the patients medicated with clopidogrel, 10 were rescheduled because of a low level of platelet inhibition and the need for increasing the drug dose and retesting. Periprocedural complications were absent for 95.3% (60/63) of the treatments, while periprocedural thrombus formation was encountered in 4.8% (3/63) of the cases; the latter was clinically evident as worsening of the clinical situation on awakening in 1 case and resulted in an increase of 2 points on the mRS score at discharge. The absence of peri- or postprocedure rupture (early or delayed) was ensured for all cases during the entire follow-up period. Clinical mRS outcomes at discharge from the hospital were 0 for 12 (20.7%) patients, 1 for 41 (70.7%) patients, 2 for 3 (5.2%) patients, and 2 for 2 (3.4%) patients. During the postprocedure hospitalization, 6.9% of the patients (4/58) developed procedure-related ischemic events. One patient (1.7%), with a giant aneurysm, developed a perianeurysmal brain inflammatory reaction in the fourth postprocedural week, which progressively resolved under steroids. One patient (1.7%) developed ischemic stroke at 3 months postintervention following discontinuation of clopidogrel without consulting the physician. At 6-month control, mRS scores were 0 for 41 (70.7%) patients, 1 for 12 (20.7%) patients, 2 for 4 (6.9%) patients, and 3 for 1 (1.7%) patient. Clinical outcome at 6 months was good (mRS 0–2) in all except 1 patient (98.3%). Clinical evaluation at the latest follow-up showed an mRS score of 0 for 45 (77.6%) patients, 1 for 10 (17.2%) patients, and 2 for 3 (5.2%) patients. Modifications of the mRS throughout the follow-up period in regard to pretreatment status are shown in Table 1. The permanent complication rate with poor prognosis (mRS > 2) was 0%. Procedure-related morbidity was 8.6% (5/58). Absence of aneurysm rupture and 0% procedure-related mortality were ensured for the population throughout the follow-up period. Among the patients who had ischemic events or transient symptoms, 4 were treated with clopidogrel and 1, with a prasugrel regimen. Immediate postprocedure angiographic results and angiographic outcomes in controls are summarized in Table 2. Mean follow-up time for the entire group of patients was 22 ± 9 months (95% CI of the mean, 19–24 months). Mean follow-up time for the third control was 28 ± 9 months (95% CI of the mean, 19–60 months). Overall, all except 1 aneurysm (1/40, 2.5%), controlled for >2 years postfollow-up, were either totally occluded or had stable remodeled regional angioarchitecture. Statistical comparison of the 12-month with the 6-month DSA showed a statistically significant increase in the total occlusion rates for the 12-month controls (χ2, 113.088; df, 25; significance level, P < .0001). The statistical comparison between the 12-month and the late midterm DSAs for the patients who had >2 angiographic follow-ups showed that all circulating aneurysms and 55.6% of the stable remodelling cases progressed to total occlusion (χ2, 19.118; df, 2; significance level, P = .0001). From a 5% aneurysm occlusion rate on the immediate postprocedure angiograms, the series progressed to a 94.8% aneurysm occlusion rate at 12 months. None of the aneurysms in this series regressed from partial filling, stable remodelling, or total occlusion to aneurysm recirculation with time. Angiographic outcomes regarding jailed branches are summarized in Table 3. The jailed branches were unchanged in 54% of the cases at 6-month follow-up angiography, with stability in the further follow-ups up to 85%. Symptomatic branch occlusion occurred in 2/63 (3.2%), both noted within first 6 months. Three patients in the study had transient symptoms (DWI negative for ischemic events on MR imaging) attributed to hemodynamic factors during the first postprocedural months. These occurred on mean postprocedural day 33.6 ± 8.6 and resolved completely within 48 hours. One of the patients who developed postprocedure stroke at 24 hours postintervention showed sluggish flow on the final control angiogram at the end of the procedure. MCA bifurcation aneurysm therapeutic strategy has been in dispute for the past few years. While clipping remains the mainstream treatment for these lesions, recent advances in the endovascular therapeutic approaches have involved several alternatives, including balloon remodelling, stent-assisted coiling, and, lately, the use of intra-/extrasaccular flow disrupters. Recent reviews failed to show a clear superiority of one approach over the other8; nevertheless, surgery remains the mainstream approach for many cases. 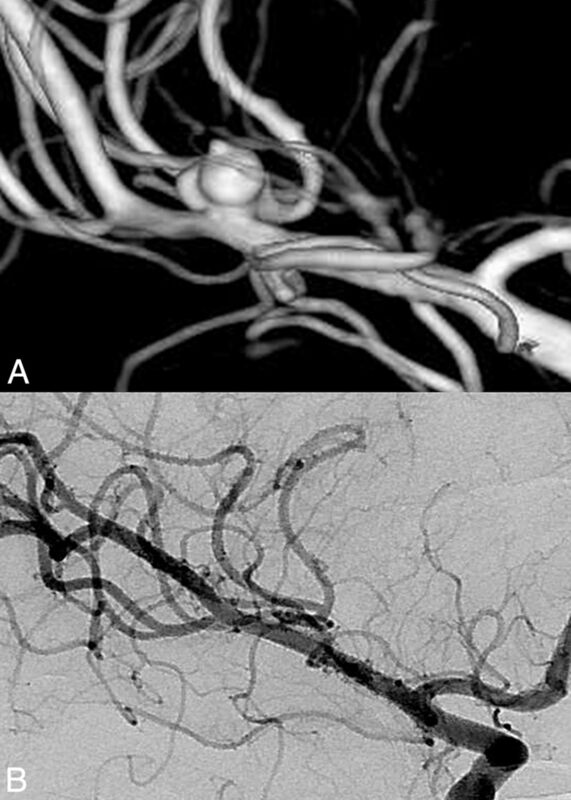 At the same time, complex cases, such as those with neighboring aneurysms9 and previous endovascular or surgical failures,10 emphasize the need for more alternatives in the neurovascular physician's therapeutic armamentarium. FD treatments are increasingly being used for distal intracranial aneurysms. Some recent data even suggest better clinical outcomes with FDs than with stent-assisted coiling.11 A recent study by Caroff et al12 in 15 patients with MCA bifurcation aneurysms challenged previous studies with endovascular flow-diversion treatments in MCA locations,4,6,13 including large and fusiform aneurysms,14 by reporting a 43% ischemic complication rate. In our study, apart from 1 perianeurysmal inflammatory reaction, reversible with steroid treatment, all other complications were ischemic but were limited to an acceptable rate (8.6%). Three of 4 thrombotic ischemic events in the study occurred with patients treated with clopidogrel, and 1, with prasugrel. Even though all patients were systematically double-tested for resistance, lower thrombotic complications seemed to occur after switching to prasugrel. In accordance with previous reports, transient symptoms were noted during the first follow-up months.18 In our opinion, they were not related to in situ thrombotic events but rather to hemodynamic parameters. These events were not positively correlated with branch remodelling or occlusion; on the contrary, they were likely the expression of a regional decrease in perfusion, related to the presence of a moderately developed pial network, which might decrease the pressure gradient inside the jailed branch17 but was not yet sufficient to compensate for the perfusion requirement. Progressive vasodilation and compensatory mechanisms were capable of resolving this matter as follows: Either the pial network was insufficient; thus, on follow-up, the jailed branch remained patent (Fig 1) or even became larger than that in previous controls; or the pial network would progressively augment, allowing at the same time, a progressive remodelling (ie, narrowing of the jailed branch; Fig 2). Overall in this study, early complications occurred mainly due to in situ thrombosis, probably related to undetected antiaggregation failures; late complications occurred due to either noncompliance with the antiaggregation regimen or hemodynamic effects. The latter resolved within hours and was not related to side branch occlusions. Pretreatment 3D image (A) shows a multilobulated right MCA aneurysm with a bleb. Note that the superior trunk originates from the sac. Control DSA 1 year after Pipeline Embolization Device placement. An image at a corresponding angle (B) demonstrates total occlusion of the aneurysm with the branch coming off the patent sac (Cekirge-Saatci class 1a occlusion). Pretreatment 3D (A) and 2D (B) images show a small, irregular right MCA aneurysm with an early bifurcating branch (arrow) originating from the sac. Corresponding DSA obtained 1 year after PED treatment (C) confirms the total occlusion of the aneurysm; the branch coming off the sac (arrow) is reduced in caliber (Cekirge-Saatci class 1b occlusion). Contrary to the recent published results from a clinical study on fusiform/dissecting MCA aneurysms, which positively associated total occlusion rates with side branch occlusion,19 our results did not show a correlation between side branch and saccular occlusion. On the contrary, an important percentage of the jailed branches remained patent. Furthermore, in cases in which the jailed branch showed transient symptoms during the initial postprocedural months, these branches tended to show unchanged caliber in the control angiographies. In this cohort of MCA bifurcation aneurysms, the flow-diversion effect, even though angiographically slow and progressive, still protected the aneurysms from rupture throughout the follow-up period (Fig 3). Angiographic assessment should probably be performed systematically later than the usual one (ie, 6 months) performed for other endovascular techniques (Fig 4). To our understanding, the Cekirge-Saatci angiographic evaluation scale seems more adapted for the evaluation of FD treatment, providing a more comprehensive evaluation not only of aneurysmal occlusion but of the whole hemodynamic modification process with time. Pretreatment 3D image (A) shows a left MCA aneurysm with the inferior trunk coming off the sac. Posttreatment 1- (B) and 2-year (C) angiograms confirm the stable occlusion of the sac with the patent inferior trunk (arrow) having a tortuous origin (Cekirge-Saatci class 5 occlusion). Pretreatment 2D (A) and 3D (B) images show an irregular right MCA aneurysm with a bleb. Note that the aneurysm has no neck, and a branch is originating from the sac. Six-month control DSA image at a corresponding angle (C) reveals the sac decreased in size, but still filling (class 2). Correlative 1-year control DSA image demonstrates total occlusion of the aneurysm sac with the relevant branch filling retrogradely (white arrow) (ie, Cekirge-Saatci class 1c occlusion). A recent study argued that the apparent shape of the covered branches and their disposition20 as to the aneurysm sac play an important role in both side branch patency and aneurysm occlusion. However, our observation is different in that these issues are more relevant to the terminal nature of the MCA bifurcation branches and the variability in pial anastomoses. The pressure gradient along a terminal artery is expected to persist after jailing, thus allowing the branch to remain patent.21 This feature may delay the process of aneurysm remodelling toward occlusion, but as found in the study presented herein, in the later follow-up, the aneurysms were occluded, with occlusion of the jailed branch not being a prerequisite. Similar to our results, other recent publications have shown good clinical and anatomic results with flow diverters for MCA bifurcation aneurysms. Zanaty et al,13 in their series of complex large, giant, and bifurcation MCA aneurysms treated with the PED, reported its effectiveness with reasonable complication rates. Recent studies report promising results from intrasaccular flow-disrupting devices; nevertheless, initial complete occlusion rates were relatively low.23 Endosaccular flow disrupters have a specific shape and are made of nitinol filaments, which preserve their shape-memory properties; thus, they may not be adapted to every aneurysm anatomy or side branch configuration. Additionally, their hyperelastic properties along with the thrombus formation inside the device presumably play a role in the deformation described in the follow-up of some cases. Even though surgical clipping has been considered a stable treatment of aneurysm recurrences, several studies have shown that this is not an absolute fact; clipped aneurysms may recur.24 Retreatment in these cases can be complicated for both the endovascular and surgical approaches. Adhesions from previous surgery, massive periprocedural bleeding, and anatomic complexity are issues to consider in microsurgical retreatment.24 Successful endovascular retreatments, though feasible,25,26 may be technically challenging for conventional techniques. Recent bibliographic data showed good outcomes with FDs in aneurysm recurrences after surgical clipping.25,27 In 2 series presented by Cekirge et al25 and Ding et al,27 2 cases of clip failures and 3 cases of previous stent treatments were successfully retreated by FD embolization with very good results. Large or giant, partially thrombosed aneurysms may be equally challenging for classic endovascular and microsurgical techniques; in this series, almost 21% of the cases were large/giant aneurysms. Flow diversion may not be the first-choice treatment for every MCA aneurysm, but complex cases may be successfully addressed, provided that some technical rules are respected, such as effective antiaggregation, careful sizing with slight oversizing, and meticulous control of stent apposition. FDs are devices that appear to work in synergy with the dynamic vascular remodelling processes of brain; the technical strategy is to favor the regional remodelling to the patient's advantage. We are still a long way from completely understanding and exploiting the full potential of these processes. Further research is needed, and until then, moderation in our conclusions would be more appropriate. FD use should be reserved for complex cases, and its results are to be evaluated with longer follow-ups. Nevertheless, taking extrasaccular flow diverters out of our therapeutic armamentarium for MCA bifurcation aneurysms seems just as imprudent as using them as first-line treatment. Even though the clinical and angiographic data bases for this cohort were maintained prospectively, the study design is retrospective; furthermore, the number of patients remains limited. Nevertheless, the conclusions of this study should be investigated with larger, multicenter studies. Flow diverters seem to be an effective treatment alternative for complex MCA bifurcation aneurysms, with reasonable complication rates. An effective antiaggregation regimen is mandatory. Longer angiographic follow-ups are needed to assess the morphologic outcome; immediate subtotal occlusion was not related to rupture in the present study. The new angiographic scale seems adapted to the evaluation of the regional vascular remodelling post-FD stent placement. Disclosures: H. Saruhan Cekirge—UNRELATED: Consultancy: Medtronic, MicroVention, Sequent Medical. Isil Saatci—UNRELATED: Consultancy: Medtronic. Accepted after revision September 15, 2016.